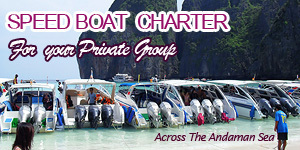 Yeah, it has been THAT long since I’ve posted the subsequent chapter on our Krabi-Phuket Getaway earlier this year. Blame it on procrastination, blame it on the lazy bones …. but here’s another short post, but on one most memorable stall on the sidewalk in Krabi, where we had our breakfasts TWICE during our stay directly opposite of the stall, at Ao Nang Grand Inn. No menu, no price list. Just stand there and point away. Being a Thai Muslim in Krabi (and they’re in abundance, I tell you), Koh Det (spelling might be wrong) operates his stall early in the mornings right in front of Bangkok Bank on the main road of Ao Nang, on the same row with McDonald’s. 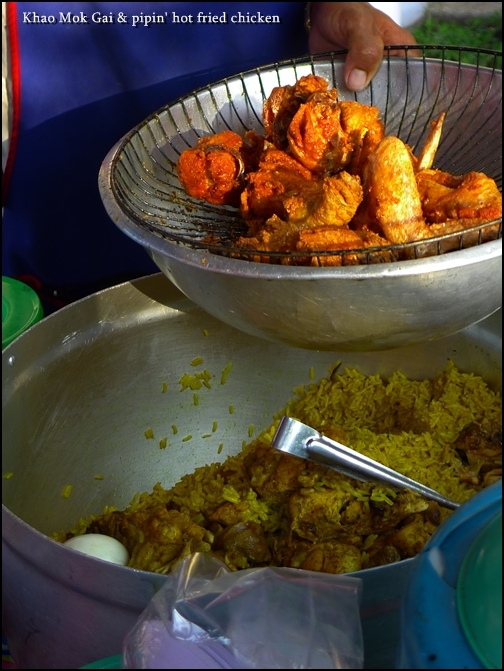 You can’t miss this row of roadside stalls, for they operate almost round the clock, interchangeably between breakfast-brunch stalls and lunch-dinner stalls occupying the same lots. 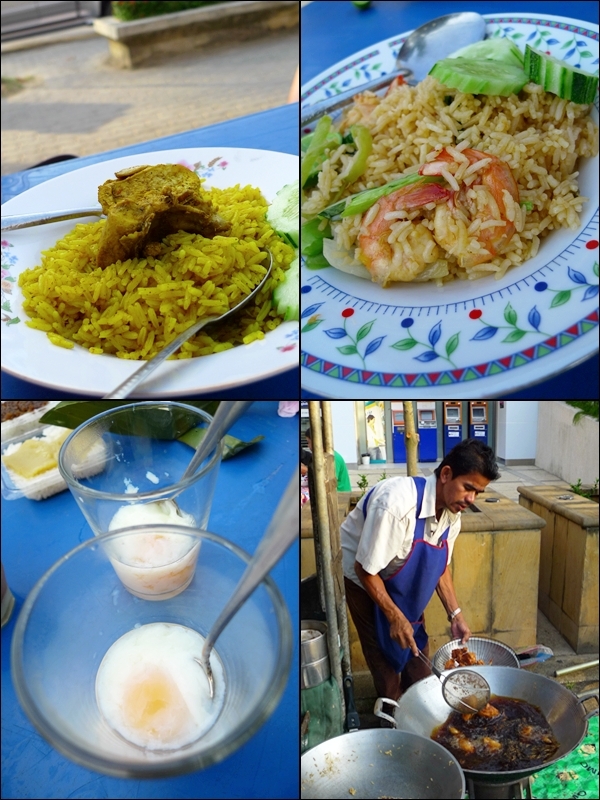 a type of Thai-Malay dish not unlike our very own Nasi Biryani. Routinely getting used to having breakfasts at 7-11 convenience stores whenever we were in Thailand, this time around I was glad we somewhat broke the mould. Somewhat, in the sense that we STILL got our early morning milk-fixes at 7-11, and snacking between meals, as well as filling up on the not-to-be-missed Lay’s Potato Chips. To cut a long story short, throughout the few days we stayed there in Ao Nang of Krabi, we have taken a liking to Koh Det’s offerings, and his cheery demeanour. 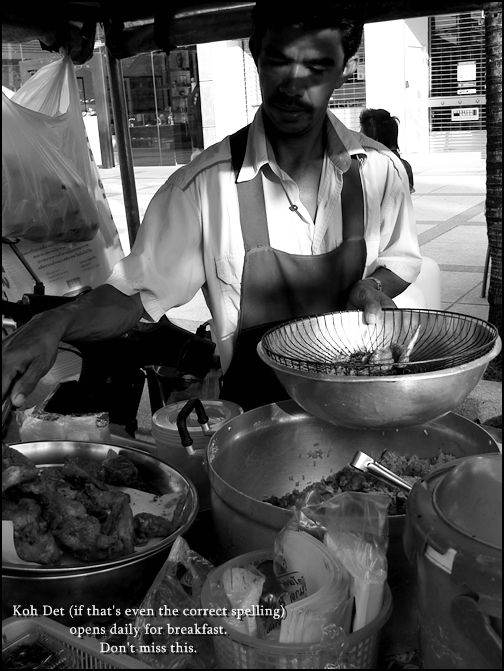 Unpretentious, conversing in Malay language (our forte, of course) and sharing of stories (from bus to flight fares, and name of the dishes), he was an affable chap alright. Almost felt at home, as though we were eating at some random mamak stall here in Malaysia. 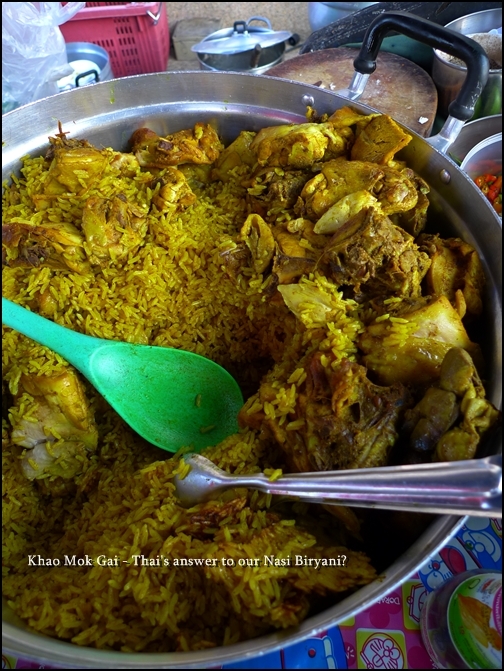 The Khao Mok Gai (or Thai Yellow Rice with Chicken) reminded me of Nasi Biryani the most, from the oblong, yellow-tinged grains of rice to the cuts of marinated chicken cooked within. A potful of Khao Mok Gai greets the customers every morning at Koh Det’s, to be served with some cut chillies and dark soy sauce, if you feel the urge to do so. start your day with some soft-boiled eggs, and do not peek at the wok-ful of DARK elixir …..
Not as fragrant as Nasi Biryani, and somewhat bland, the plateful of rice certainly needed the extra chopped bird’s eye chillies to perk things up. Of course, you can opt for his Khao Pad (fried rice) with prawns as alternatives, or ask for an extra order of fried chicken, fresh from the wok. 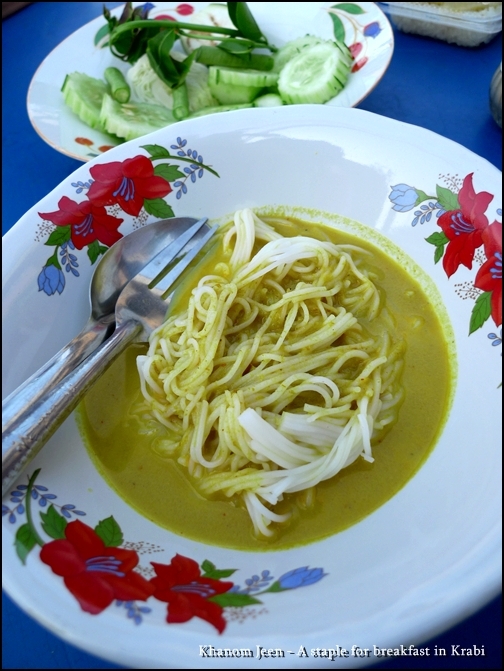 Another one of his specialty, and one of southern Thailand’s most famous breakfast of choice is the Khanom Jeen, comprising of rice vermicelli noodles served with fish curry sauce (or in some instances, chicken or pork ribs curry) and slices of cucumber, and raw greens on the side. At only 29 baht / RM2 / USD0.60 per serving, you bet you can down packets of these in a flash. The thin, long strands of noodles resemble spaghetti, and the yellow curry was not spicy at all, but instead very rich, bursting with flavours from the spices and coconut milk. But personally, I liked the Khao Niao Gai the most. Sticky glutinous rice served with shreds of poached chicken meat, topped with a dark sauce akin to our ‘taucu’ sauce (preserved soybean paste), and cuts of cili padi. 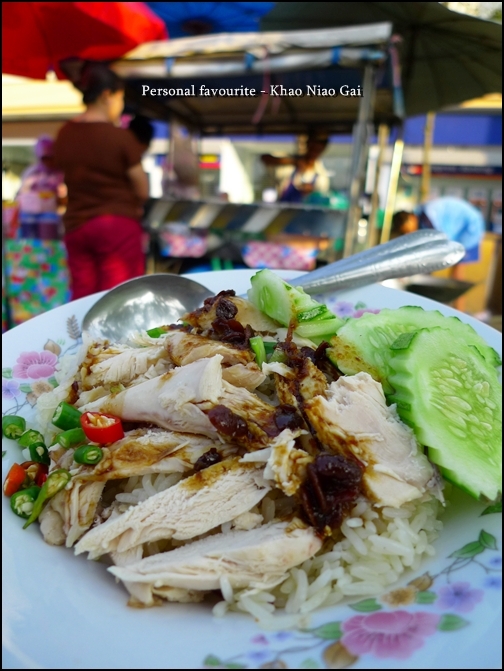 The bland looking plate of rice with chicken may look boring, but trust me, this is something you should try at least once in Krabi/Phuket. Of course, you can also find this in northern Thailand, for glutinous rice can be served with virtually anything in Thailand. 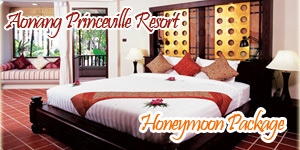 But only in southern Thailand can you find this version which is also HALAL, meaning this should be a hit with the Muslim tourists. 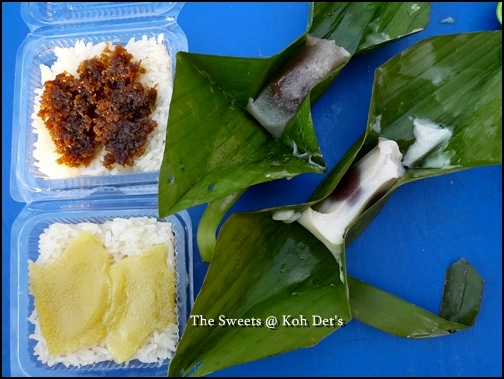 And some sweets to end the session …..
Aside from the assorted range of savouries for breakfast-brunch, Koh Det also serves a variety of sweet snacks (kuih-muih) to cater to the lighter eaters. The sticky rice with ‘kaya’ (coconut & egg jam) was especially memorable, for the almost beige-coloured kaya was richer than our variety here, but tasted smooth and complemented the sweet-ish glutinous rice perfectly. Different from Keng Nam’s version for sure, and not as sweet. The ones wrapped in banana leaves resembled ‘kuih koci’, with a slightly salty taste, and the glutinous rice with shredded sweetened coconut was passable as well. So if you’re ever in Krabi, and staying around Ao Nang, do look out for this stall, and its neighbouring ‘wonders’, serving from burgers to sandwiches, and pancakes to fresh fruit juices.